We spent our annual holiday on the slopes of the Swiss Alps. Skiing away with nice fresh snow and gorgeous weather. I must admit I was on the verge of posting here. However, I chose to have some more quality time with the family. I even played some chess and started to remember some long forgotten openings and off course due to this rustiness lost a couple of games. I learned in the meantime of the sad early death of former World Champion Bobby Fisher who was a colorful chess player in his heydays. 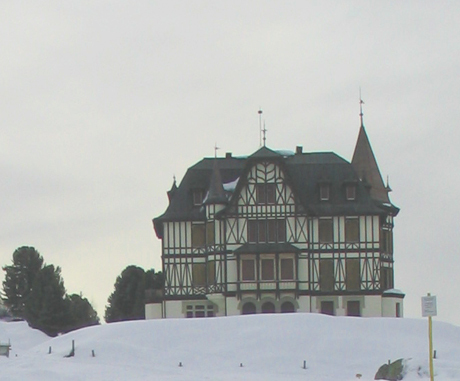 The slopes were located in the vicinity of this old villa. It has an interesting history. Was built in the beginning of last century. Served as hotel for over 45 years, but has now another destination after an extensive renovation in the seventies. I dare my readers to guess what the name of the villa is. Next week year more. It looks very familiar. Was it in a movie in the last 10 years or so? I’ve also been to the Swiss Alps but I would remember it if I had been there…so I haven’t. I am not aware it was in a movie, Adam. What is your favorite Swiss destination?